Kobeli lived in Kroonstad, the town of his birth, as well as Alexandra and Soweto in Johannesburg. He has been referred to by some as the ‘Chagall of Soweto’, and works such as his earlier Soweto vision VI (1980)1, and Impressions (undated)2 seem to justify this tag in some ways. Like Chagall, he experimented with freely-arranged areas of abstraction which incorporate figurative elements which vary in scale. There is furthermore no sense of perspective or gravity in these works which seem reminscent of this artist’s playful spirit. Children playing in an urban landscape is a similar exercise in using abstraction as a basis for a representational image. Interesting to note here is the fact that Kobeli shared a mentor with Ephraim Ngatane (See ReVisions, pp. 154- 157) in the Rev. Hall Duncan. In many ways their approach to painting is remarkably similar. In this work by Kobeli, broadly brushed areas of yellow, white, green and black were applied in a calculated manner with an emphasis on horizontal and vertical gestures. Loose slabs of colour of varying scale were used to establish a sense of pictorial structure. Using the same but contrasting colours on the palette, Kobeli then picked out the forms of shacks and houses as suggested by the abstract forms. Once these areas were dry, green, yellow and black were also used to articulate small human forms at play. Pelmama Collection, mixed media on paper, 50 x 68 cm. University of Fort Hare Collection, mixed media on paper, 50 x 70 cm. See E.J. de Jager, 1992. Images of Man. University of Fort Hare Press. p.8, plate 43. Born Kroonstad, Orange Free State, 1932; Died 1999 Studies 1958: Polly Street Art Centre, Johannesburg, under Cecil Skotnes, also taught by the Reverend Hall Duncan, an American missionary. Exhibitions A member of Artists under the Sun. Participated in many joint exhibitions in South Africa (1963: Lidchi Gallery, Cape Town), the United Kingdom and the United States. 1981: Solo exhibition, Gallery 21, Johannesburg. 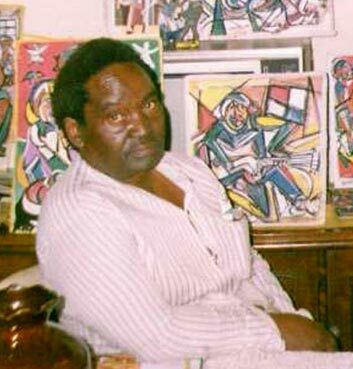 1982: Exhibited on the Exhibition of South African Art at the National Gallery of Botswana, Gaberone. 2007: Beyond the margins: selections from Soweto, South Africa, Hillyer Art Space, Washington, DC. Collections De Beers Centenary Gallery, University of Fort Hare, Alice; ABSA Art Collection; Sanlam Art Gallery; Sasol Art Collection.